Where in the warehouse are the forklifts? Which goods are they transporting and where are these items being placed? Routes can be efficiently organized. This is done by using automatic location and loading controls and route registration. 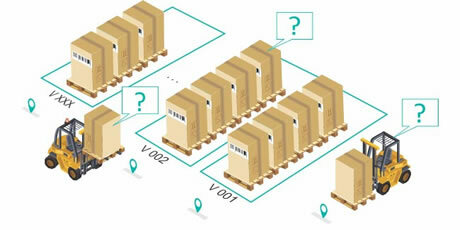 Companies can also get an accurate, up-to-date overview of their internal logistics movements. In order to locate forklifts, Aucxis fits them with passive RFID's. Aucxis is a Belgian automation company. Determining the forklifts' locations can be done in realtime. It can also be done on a continuous basis at a single site or at strategic places. These locations can, for example, be zones changes - floor location, shelf location. They can also be at scanning, pick-up, drop-off, and so on. Floor tags are easily place in the floor. These act as marking points for the creation of a clear location grid. No complex infrastructure is needed for this. Forklifts can also be equipped with detection equipment. This is used to read RFID tags or barcodes (1D/2D). This equipment ensures the automatic scanning and registration of transported items. This is also true for load carries such as pallets, boxes, and containers. Manual scanning is used as little as possible.